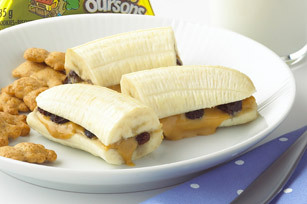 A simple fun idea using peanut butter, bananas and raisins to prepare in the microwave. Use small spoon to slightly hollow out centres of banana halves; fill with peanut butter. Sprinkle with raisins. Reassemble banana; place on microwaveable plate. Microwave on HIGH 15 to 20 sec. or just until warmed. Add your favourite toppings, such as dried cranberries or chopped nuts, just before serving. Or, substitute them for the raisins. Prepare using Kraft Light Smooth Peanut Butter or Kraft Crunchy Peanut Butter.